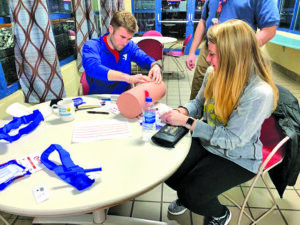 HSHS St. Elizabeth’s EMS System Outreach team members conducted a Stop the Bleed training program at the East Belleville YMCA on March 3, 2019. The attendees learned the importance of direct pressure and tourniquet use in order to save a life by stopping critical bleeding. HSHS St. Elizabeth’s Hospital Emergency Medical Services has adopted a national campaign and is bringing education to the public to be prepared to help someone in a bleeding emergency. Stop the Bleed is a national awareness campaign and call-to-action. It is intended to cultivate grassroots efforts that encourage bystanders to become trained, equipped, and empowered to help in a bleeding emergency before professional help arrives. Brad Perry, EMT-P and Manager of Emergency Services at St. Elizabeth’s Hospital, said when people experience physical trauma, often they bleed to death versus dying of their injuries. This is an outcome that has been learned through recent war and events like the Boston Marathon bombing. Perry said the campaign and educational program really expanded after the Boston Marathon bombings in 2013. Perry said Stop the Bleed has only grown and expanded since its induction – it began with educating trained professionals, then moved toward schools and now – the general public. Perry said it’s especially important to educate the general public because of the increase amount of mass casualty events. As bystanders are always the first on the scene of a trauma, Perry said it’s important to learn the steps to stopping a bleed. • If the bleeding doesn’t stop, place a tourniquet as high on the extremity as possible above the wound. The tourniquet may be applied and secured over clothing. Perry said a lot of people are intimidated by tourniquets because they think they can do more damage with them but “this is life over limb.” It is important to note that advancements in prosthetics have lessened the stigma around them from in the past. “Yes, they could lose a limb from a tourniquet, but they could also die,” he said. In April 2018, St. Elizabeth’s was recognized by the Illinois Department of Health (IDPH) as a Region 4 EMS System Resource Hospital. St. Elizabeth’s has two outreach educators for the Stop the Bleed program. Perry said they will go to places such as the YMCA, the library or “any group of people that want to learn.” If an organization is interested in scheduling a Stop the Bleed presentation, they can contact Perry at Brad.Perry@hshs.org. The program is a 90-minute course including a formal presentation and hands-on practice of direct pressure application, wound packing, and use of a tourniquet.